As the title suggests, I’m sharing about some of the wonderful WiFis I’ve had, most of which are not so recent, but get more recent farther down in the post. 🙂 I took lovely visits to Kiki’s and Lenore’s towns, as well as two festive visits to Angie’s towns. 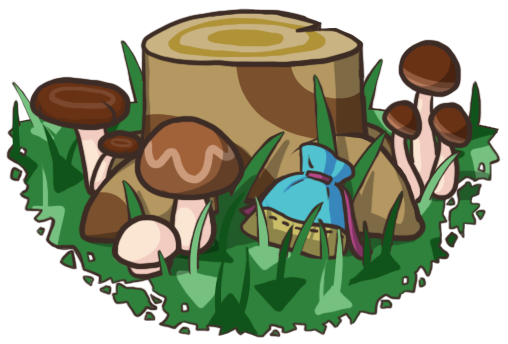 To start off with, this is a WiFi in Kiki’s town Meadow should have actually been shared about in my last AC:NL WiFi post. I didn’t intentionally leave it out, but the screenshots from this WiFi got lost in a particularly huge SD card-importation, and I didn’t find them until later. Ahh what a cool tree-lined pathway to the cottage — and I love its exterior, too! 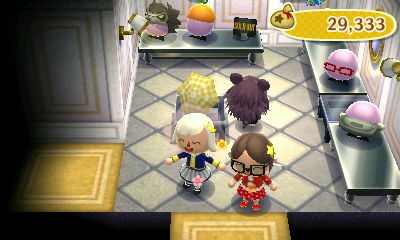 Kiki even gave me a villager pic to take home with me — Freya’s! Thanks so much Kiki, that was really nice of you ❤ Thanks for having me over as well, and sorry for this late post on it! I thought this was a cool view of the town hall roof with the golden garden behind! The trail leads to some topiaries and a fountain, creating a pretty little secret garden ❤ And it's a great use of this little space by the river! Lenore’s town is themed around the four seasons, and the spring-themed castle’s interior is coming along nicely! My favorite addition of all was probably the little sparkling blue pools by the town hall, fenced in by bushes. I just love the effect! This was a very fun WiFi; I got to visit Angie’s Halloween-themed town of Yorkwood for a Halloween party! The gift I was most thrilled about picking up was this yellow glow wand!! 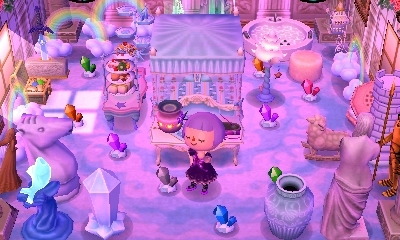 The last time the winter solstice event rolled around in my town, I got four blue glow wands, so I’m very excited to have a different color now It reminds me of a witch’s magic wand, so I’ll probably give it to my character Violet to carry. Besides the goodies and fun Angie and her guests provided, there was also the standard festivities to enjoy as well, trick-or-treating the villagers and searching for Jack. This winding river surrounded by wildflowers and foliage is perfect. Angie said the purple houses were an accident, too, how lucky! She picked them based more on Halloween-style villagers (like Kiki and Muffy) and on who was available on trading/’adoption’ sites. The first thing I did was head to the plaza to meet Maplerow’s Isabelle and get a NYE hat from Redd. The only options for me were the green hat or the yellow hat, and I chose the yellow one, but ended up getting the other color hats in the gift-wrapped goodies scattered all over Maplerow ❤ Thanks for those, Angie!! A glimpse of the special 2015 firework! Not the best pic, though. Having fun in the adooorable playground next to the kindergarten-themed house! Towards the end of the party we glitched across the train tracks and had fun there! I was taking an embarrassingly long time to glitch across with the net trick, so Anne/grcninja helped me out by doing the tweeter trick instead — thanks Anne! Posted on January 5, 2015 by Amy •	This entry was posted in AC:NL, AC:NL WiFi and tagged Animal Crossing. Bookmark the permalink. These parties look like so much fun!! I had fun just by reading along All the towns look absolutely gorgeous, I love finding beautiful little spots in every town and taking pictures, especially group ones ^^ That NYE party in particular seemed very fun!! I used to celebrate the New Year in Wild World with friends of mine, we would always have a blast!! I haven’t had as much time to play as I’d like either — I wish there was more time in the day T_T My town’s still in summer too actually xP I don’t mind too much, I’m enjoying it a lot since the first time it was summer in my town, my town was sorely underdeveloped. It was! 🙂 Haha we all have those days 😛 I think it looks a little less ridiculous than the Tingle hood! I’m not doing one on Citalune anytime soon probably, but I could do another dream diary probably! started a new town. Sorry for my late comment and hi again, or rather bye. Hi! Thanks so much 🙂 I got a lot of bells early on through beetle-hunting on the island — going there after 5 pm and catching as many beetles as my island basket could carry, going back to town and selling them all, and repeat 😛 Good luck with your new town and I’m sorry for my late reponse! These towns are so pretty! My favourites have to be either Citaluna or Maplerow. new brick paths you will like xP. Sorry for the long comment! Hello Amy! I was wondering if we could be friends? I recently restarted my town and I thought it would be nice to meet you on Animal Crossing.